The Viscount de Figanière, a Portuguese author, diplomat and historian, was a personal friend and student of Helena P. Blavatsky. Born in New York in 1827, he lived and worked in Brazil, Russia, Spain, England, and France. Figanière is quoted in the work “The Secret Doctrine”, by Ms. Blavatsky, and has his articles published in the two magazines founded by her. His great 1889 book “Estudos Esotéricos” (“Esoteric Studies”) remains the main classical work of theosophical literature in Portuguese language. Short stories are not uncommon in theosophical literature. Helena Blavatsky wrote a number of them, some of which involve murder. An assassination also occurs in “The Shoemaker of Seville”. However, the story by Figanière has less blood in its paragraphs than many a scene in Shakespeare’s plays. This is a story about justice. It describes human despair in social injustice. It offers the reader a moral portrait of Christianity in the late Middle Ages, including its clergy. While it is an illusion to think that violence can bring about justice, sometimes justice is made in ironical ways, and equity and compassion can often emerge as surprises. “The Shoemaker of Seville” was published several years before Figanière went to Madrid in April 1867 to work for one year as a diplomatic representative of Portugal in Spain. The story is historical: Pedro of Castile was born 30 August 1334 and died on 23 March 1369. He was the king of Castile and León from 1350 to 1369. 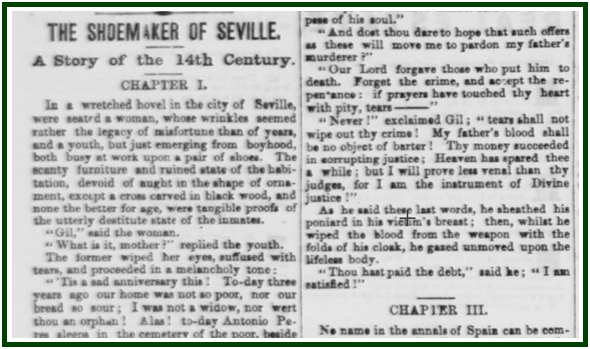 “The Shoemaker of Seville” is reproduced from the “Daily Alta California”, San Francisco, USA, Volume 13, Number 4,132, dated 9 June 1861. The investigation made by Joana Maria Pinho reveals it was first published in “New York Ledger”, USA, number 8, April 27, 1861. In both occasions the story appeared with no name of author, but there is no doubt about who wrote it. The authorship is indicated in various places, including Figanière’s biography on p. 198 of the book “Portugal e os Estrangeiros”, second part, by Manuel Bernardes Branco, vol. II, Imprensa Nacional, Lisbon, Portugal, 1893, 703 pages. In a wretched hovel in the city of Seville, were seated a woman, whose wrinkles seemed rather the legacy of misfortune than of years, and a youth, but just emerging from boyhood, both busy at work upon a pair of shoes. The scanty furniture and ruined state of the habitation, devoid of aught in the shape of ornament, except a cross carved in black wood, and none the better for age, were tangible proofs of the utterly destitute state of the inmates. “What is it, mother?” replied the youth. “True: but ’tis well to let wounds bleed, and hate fret itself!” replied the youth, with a grim smile. The mother perceived her son’s meaning, and seizing one of his hands, gave it a tender pressure. “To be quartered alive?” asked the youth, interrupting. “No: to be deprived from assisting in the choir with the other members of the Chapter during a whole year”, continued the widow. It was Corpus Christi day; the people of Seville were collected in dense crowds in the vicinity of the cathedral, in order to view the procession. The churches were adorned with all the grandeur of Catholic pomp; the streets were strewed with flowers; in a word, the city which was so often deluged in blood by the broils of the nobles and the savage despotism of the king, had assumed an unusual appearance of gaiety and festivity. In the midst of the general stir and bustle, there was one, seated on the steps of the alcazar, who seemed to take no interest in the tumultuous joy of the crowd. He was still young, but his austere and wrinkled face showed the ravages brought on by harrowing thoughts and premature sorrow. On beholding the disheveled state of his hair, the melancholy glance of his eye, the convulsive vivacity of his gestures, the anomalous combination of feebleness and energy, of wildness and despondency, which discomposed his features, it was easy to guess that his heart was lacerated by the vehemence of his passions, and that the bloom of youth had been withered by misfortunes of no ordinary nature. He remained for several hours buried in thought, his head leaning against one of the columns of the alcazar. “No”, answered the priest, starting back, and endeavoring to free himself from the grasp of his assailant. At that name the canon turned pale and trembled. “Villain!” exclaimed Don Henriquez, in a faltering tone. The priest had hoped that his clerical office would be a safeguard against violence; but when he heard the youth’s virulent expressions, when he saw the glistening of his eyes and his colorless lips – unmistakable symptoms of merciless wrath – he became aware that hope lay not that way, and that he now must have recourse to humility and entreaty, in order to save his life. As he said these last words, he sheathed his poniard in his victim’s breast; then, whilst he wiped the blood from the weapon with the folds of his cloak, he gazed unmoved upon the lifeless body. No name in the annals of Spain can be compared with that of Don Pedro of Castile in the enormity of his crimes. The poisoning of his wife, Donna Branca, and of his brother Frederic; the murder of Albuquerque, of the Jew Levi, of Mohammed, King of Granada, and of many others; the butcheries of Toledo, the taxes under which he made the people groan, the confiscations he devised, the torments  he invented, and the licentiousness of his conduct have all helped to give to the name of this prince a fearful celebrity. Yet, notwithstanding the monstrous crimes with which he tainted the throne, Don Pedro of Castile evinced, on a great many occasions, a certain regard for justice; and, although it never proved a barrier to his own passions, he seldom allowed others to follow his example. The Spaniards call him indifferently Pedro the Cruel, or Pedro the Just. Immediately after he had killed Don Henriquez, Gil gave himself to the authorities of his own accord, confessing the deed he had committed; and, being brought to trial, was condemned. The case, however came to the ears of the king, then at Seville, who gave orders that the matter should be left in his hands, and the culprit brought before him. “Thou art accused of having assassinated the canon Don Henriquez”, said the king to the prisoner. “And I most assuredly did kill him”, he replied.